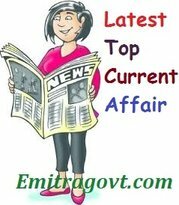 Current Affairs Question 2017: Looking for 17 September Current Affairs? Then start your Quiz right now by answering them. Here in this article, we are giving the Current Affairs Quiz with Questions and Answers. As many people are preparing for various government exams it became mandatory for them to get a grip over the current affairs as in most of the tests are based on Daily Current Affairs. By taking this kind of Current Affairs Quiz candidates can eventually get hold of what they have been working on. Contenders can trust us as we will update all the latest Current Affairs in this quiz. For more such quizzes check our site Emitragovt.com regularly as we will update the Daily Quiz for current affairs. 1. The Advertising Standards Council of India (ASCI) appointed Abanti Sankaranarayanan as the chairman of its board. 2. The Sports Authority of India has signed a Memorandum of Understanding (MoU) with the Nippon Sports Science University, Japan (NSSU) to facilitate and deepen international education cooperation. 3. Debabrata Mukherjee, vice president of Coca Cola’s South West Asia region operations, has been unanimously elected as the chairman of the Audit Bureau of Circulations (ABC) for 2017-18. 4. Halimah Yacob, a former speaker of parliament from the Malay Muslim minority, sworn in as the first female President of Singapore. 5. Nepal has signed an agreement with the US government’ Millennium Challenge Corporation to receive a grant worth USD 500 million in next five years to spur private investment and economic growth to reduce poverty in the country. 6. Infosys Foundation, the IT major’s philanthropic arm, has signed an agreement with Visakha Jilla Nava Nirman Samithi (VJNNS) to construct water supply systems in tribal villages of Visakhapatnam. 7. India dropped 10 places in the latest FIFA rankings and now it is ranked 107th. 8. Senior bureaucrat Rajni Sekhri Sibal has been appointed the director general (DG) of the government-run National Institute for Entrepreneurship and Small Business Development, in place of Vijay Kumar Dev.